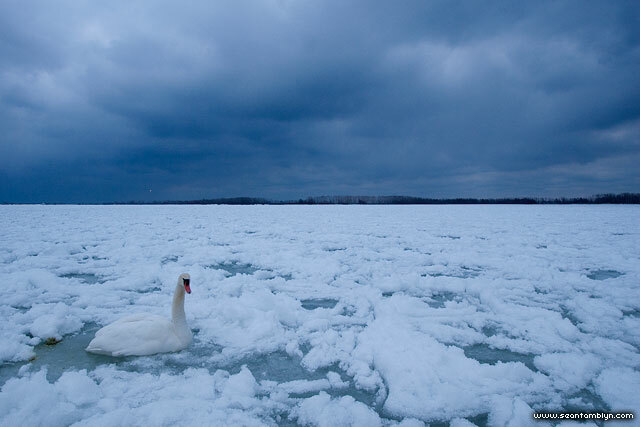 A wounded mute swan sits on the ice pack of the outer harbour, waiting as a winter storm approaches. This entry was posted on Friday, February 18th, 2011 at 12:16 am. It is filed under Birds, Lagoon Report XIX, Lagoon Reports, Mute Swans, Once There Was Winter Part II, Wildlife and tagged with Canon EF-S 10-22mm f/3.5-4.5, Canon EOS 20D. You can follow any responses to this entry through the RSS 2.0 feed.